Look closely at the pictures of demonstrations taking place in Iran this week and you will see them: thousands of women taking to the streets to peacefully protest an election they say was stolen. "We feel cheated, frustrated and betrayed," said an Iranian woman in a message widely circulated on Facebook. For these brave wives, mothers, sisters and daughters, their march to oust Iranian President Mahmoud Ahmadinejad has everything to do with their desire for equal rights. These women invested their hopes in Mir-Hossein Mousavi, the presidential candidate who pledged to reform laws that treat women unfairly. As it stands now, an Iranian woman's testimony in court carries only half the weight of a man's. Women do not have equal divorce, child custody, or inheritance rights either. Either [Ahmadinejad] cannot tolerate highly educated women, or he's discouraging women from playing an active role in society. Thousands of women have observed Rahnavard's call to climb up on their rooftops and chant "Allah-o-Akbar" -- a rallying cry of the 1979 Islamic Revolution. In this unforgettable video that captures the late-night chanting, the woman speaking is saying, "Take our phones, our internet...take all our communications away, but we are showing that by saying Allah-o-Akbar we can find each other." 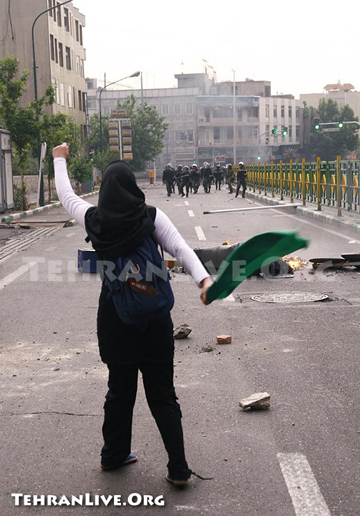 The regime in Iran obviously feels threatened by peaceful female activism. They branded as illegal the One Million Signatures Campaign initiated by women's rights groups in Iran, a campaign to change discriminatory laws against women in that country. Dozens of women involved in the effort have been harassed or jailed by the government. One of Iran's leading women's rights activists Sussan Tahmasebi told NPR that this election marks the first time women's rights have been addressed in a detailed way. "Candidates have moved beyond vague slogans that emphasize the high cultural and religious value placed on women, to addressing specifically the demands voiced by women's right activists. This shift demonstrates the importance and vitality of the Iranian women's movement, and in particular the achievements of the One Million Signatures Campaign." The courage of these women to confront Iran's patriarchal theocracy (in which the morality police still prowl the streets looking for women wearing make-up) may have been "a big reason why the regime rigged the vote count -- and why supreme leader Ayatollah Ali Khamenei was forced to make a show of ordering a probe of the fraud," said the editorial board of the Christian Science Monitor in their op/ed posted on Monday. "Eventually," said the editors, "Iran's women will not be denied." Huffington Post's Nico Pitney is liveblogging events in Iran. On Saturday a young Iranian woman named Neda Soltani was shot to death while talking on her cell phone. She wasn't actively protesting; she was a quiet sympathizer. Now Soltani has become the face of Iran's struggle. Read more. For a different perspective on the election, I interviewed an Iranian-American who believes Ahmadinejad won fair and square. The post includes comments made by Russian journalist Eugene Pozhidaev, who says "The revolution will not be -- yet. The protesters number in the thousands, not the millions. The new Iranian middle class is not sufficiently strong." Read more. Iranian expats around the world are signing a Green Scroll that is two kilometers in length -- the world's longest petition -- proclaiming "Ahmadinejad is not Iran's president." Read more and watch the slideshow. Today Iranian authorities opened a mass trial against more than 100 election protesters, accusing them of conspiring with foreign powers to stage a revolution. Leading opposition candidate Mir Hussein Moussavi issued a call on his Web site, Ghalam News, for Iranians to resume their nightly protest chants of "God is great" more intensely than ever. Those protests have infuriated the country's ruling ayatollahs. Read more.